3 home buys, 3 failed home inspections, NOW WHAT? 3 home buyers, 3 failed home inspections, NOW WHAT? Lately there have been so many disastrous home inspections. I recently had 3 transactions where the home inspections have fell through. This has been super frustrating for my first time home buyers as they expected things to go super smooth. Let me tell you about the situations. Estella whom is a 2nd time buyer and has been looking for an investment property for a while has been wanting a 2-flat in the city of Chicago near portage park. She likes real estate and wanted an investment tool to have in her portfolio aside from stocks and bonds. She wanted to have a steady flow of income from tenants and also to help pay for the mortgage on the property. We have been looking for about 5 months and unfortunately most of what we have been looking at are total fixer uppers. She doesn’t mind cosmetic work but most of these have high ticket items to be fixed like roof or electrical work. We’ve seen a ton of foreclosures. We finally found one that was an estate sale (this is where someone passes and most of the time a family member inherits the property) There was a long time tenant of 10 years on the 1st floor and the 2nd floor was vacant the old tenants had moved out so the owner did some remodeling and put it up to 2018 standards. The basement was unfinished but they had a ton of furniture down there but it looked descent no signs of water seepage or nor did it smell musty. We negotiated a price and lock in terms and then came the home inspection. What did the inspector find? MOLD in the basement. Because there was so much furniture we were never able to see behind the big set of sofas and china cabinets. The inspector moved some of the furniture to be able to see the concrete walls but what did it was his moisture meter tool where it showed if moisture or water would come through he walls. HIs tool started beeping loudly so he new there was definite signs of water coming in. Once he finished conducting the inspection he let Estela know that the reason the water was coming in was due to the tuck pointing being so badly damaged from the outside that the seepage was coming in through the brick of the home. This was a deal killer since Estella had previous flooding problems in her primary home that she didn’t want to deal with another one of these issues. She cancelled the deal and got her earnest money back. 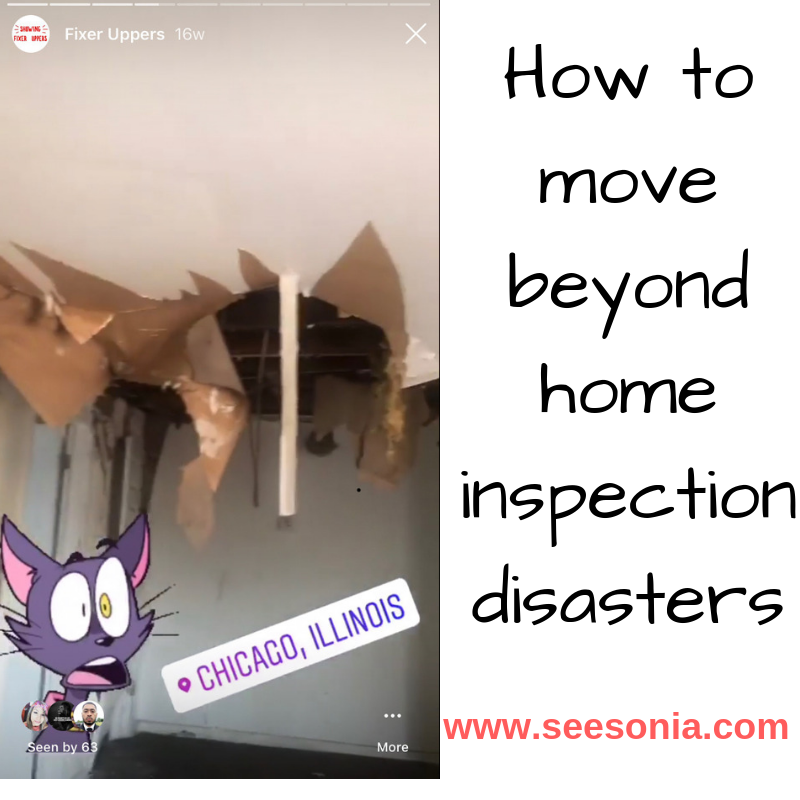 Here is a quick video of a past first time home buyer home inspection and Mike the inspector showing of how an ejector works and how to prevent water from coming into your home. The next client of mine Don is a first time home buyer who has 3 small children ages 2, 5 and 9 with a beautiful wife named melanie. Don is an old friend of mine and I’ve known him since he was very young. He currently rents in the city and wanted to move out to the suburbs to get a bigger yard for his kids and some more space for his kids to run around in. At first he was looking in the city and we found a ranch style home with 2 bedrooms on main floor and a finished basement. We went under contract pretty quickly as this home was getting lots of attention from other home buyers since it was reasonably price approximately $215,000 in the portage park area. We got finally got to the home inspection period and the inspector started on the main floor. He found that all the electrical outlets didn’t work and some of the light switches were backwards. He went on to the kitchen and found that there was a leak under the sink and the whole bottom baseboard of the cabinet was rotted. He also pointed out that the ceiling fan was wiggling and close to falling on our heads. He ended up going to the basement and opened up the electrical box to find so many double tapped wires and instead of it being a 100 amp panel it was only 50 amp basically the whole electrical wiring system had to be redone. The foundation also had tons of hairline cracks and the flooring was very uneven. Needless to say that this experience left a bad taste in Don’s mouth he didn’t think that all these small issues would come up. At this point he thought to himself do I take the house with all these electrical problems, he said “No”. Unfortunately the seller’s wouldn’t repair or give any type of credits towards the problem so he decided to cancel. He got his earnest money back we continued to look. I move on to my client Kristy and her husband Jose we looked for a home for over 1 year. They put contracts on 4 different homes throughout the year and each time it fell apart it was due to the home inspection. The first home they looked it was was rehab but when it came to the home inspection the inspector found moisture and mold behind the drywall. He also found that the foundation was missing sealant around the whole home. After the 3rd home they found they decided to just buy a fixer upper and not have to deal with issues coming up during the home inspection. They knew going into it that it had to be fixed up. They still did the home inspection but this time they knew that items such as electrical and plumbing were going to pop up anyway. Unfortunately when it came time to the appraisal that is what killed the deal. You see the appraiser said that they needed a mold certification, electrical certification and roof certification. Since the home was a foreclosure and being sold as is the bank was not going to pay for all these certifications so they decided to cancel the deal. The last and final home they saw also had a home inspection and finally there were only minor issues that Kristy and her hubby were able to deal with. At the end of the day as a first time home buyer you have to know your own limits. Are you willing to deal with a roof needing replacement, cracks in the foundation, peeling paint or even a slight bit of mold in the corner of the house. Everyone has a threshold they are willing to deal with, you have to know what’s yours. However just realize that unless you are getting a brand new home there will always be compromises you will have to deal with because there is no such thing as a “perfect home” that type of home is the one that you create and build with you own creativeness and likes.